The amount of space afforded to women in Islam has long been a topic of debate. Traditionally, men lead prayers at home and outside. Men raise the call to prayer, preach during sermons, and take up more space in mosques. There are far less female imams, and women typically pray in separate, more modest quarters allocated to them. 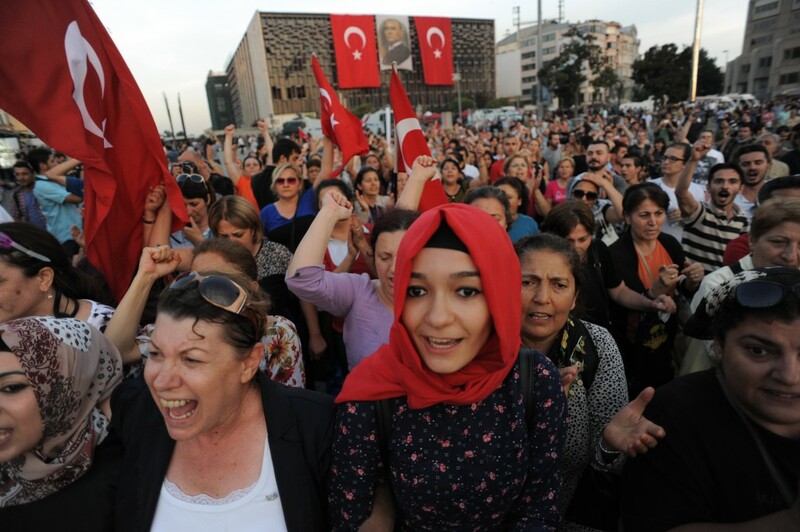 Image Attribute: Women participate in peaceful protest in Taksim Square, Istanbul. Turkey. In 2011, Istanbul's former deputy mufti, or Muslim jurist expert Kadriye Avci Erdemli implemented the "Beautification of Mosques for Women" campaign, which strove to improve the facilities and conditions of women-designated areas in the city's mosques. In a city that is home to more than 3,000 mosques, including a few of the world’s most majestic, Erdemli had found that many betrayed Islam's message of equality in spaces of worship. While men are more obliged to attend mosques within Islamic tradition, the conditions of female spaces in Istanbul were turning away women from visiting these sacred places at all. Inspections under the campaign revealed that many mosques lacked female toilets, and that the areas reserved for women were either unkempt or used for storage purposes. The walls and curtains that carve out these spaces also limited the view women had of the mosque from where they were situated—at the back. While Turkey has tackled this issue by enhancing the spaces allocated to women, women in other parts of the world are taking matters into their own hands. In January 2015, the first women-only mosque opened in the United States. Located in Los Angeles, the Women's Mosque of America was founded by two women who sought to improve the place of Muslim women who are often relegated to second-class status in their communities. In China, the women of the country's minority Hui Muslim community have been symbols of female leadership and empowerment for over 300 years.Nusis are women-run mosques that cropped up in Hui Muslim enclaves in China due to the scarcity of male Islamic teachers. In order to preserve their faith from getting usurped by the majority Han culture, the community encouraged their women to promote Islamic education among their young. What started out as Quranic schools for girls transformed into mosques run solely by women, with female imams spreading Islamic education, leading prayers, and delivering sermons. While these independent female spaces represent a positive anomaly in Islam's status quo, the struggle remains for women fighting for space within areas where men have traditionally dominated. Islamic scholars diverge on whether women are allowed to pray in the same space alongside men, and whether they are allowed to lead mixed congregations. When asked what she thought of gendered spaces in mosques, one 23-year-old Turkish woman, named Cansu, said, "Women and men need their own space. The issue is not the segregation of space, but of equal rights. Women should have the same amount of area and facilities in the mosque as [men]. Most mosques in Istanbul don’t have this." On March 18, in honor of International Women’s Day, Amina Wadud, a well-known American Islamic scholar and author of Quran and Woman: Rereading the Sacred Text from a Woman’s Perspective, led a mixed congregation in a Fridayjum'ah prayer. As the imam, she delivered the sermon and led more than one hundred men and women in prayer. Although it was not the first time a woman was the head of a mixed gender congregation, it was the first to gain international attention. While some hailed it as a revolutionary, groundbreaking step towards representing Islam's egalitarian message, others condemned the defying of Islamic tradition. The event even received bomb threats and was finally held in an inclusive church in Manhattan. Journalist and activist, Asra Nomani who specializes in Muslim reform and Islamic feminist movements, was the primary organizer of the March 2015 event. She raised the call to prayer without donning the headscarf, earning criticism for her methods of promoting gender equality and encouraging mixed gender prayer worldwide. Cansu's friend, Sena, 21, had a similar viewpoint. "I think for your concentration during prayer, it's important for men and women to have their own space. According to my religion and opinion, women and men are different. Women are more emotional, and we need to be protected. There are different roles and I have no problem with men being in front of me in prayer." The issue of women's space and rights in Islam has hence stirred debate between different Muslim circles. The tension between what is perceived as Western feminism and Islamic feminism, as well as between conservatives and liberals, is a thread that runs through various issues on the minds of today's Muslim societies. It is worth recognizing, however, the steps taken in respect of women and their empowerment, such as the beautification of mosques campaign in Turkey and the women's mosques of China’s Hui. Zafirah Zein is a fourth-year student at Northeastern University in Boston, where she is studying Journalism and International Affairs with a concentration in Middle East Studies. Her dream is to become a Middle East foreign correspondent and, she is excited to be reporting for the Fuller Project for International Reporting in Istanbul, Turkey. She has previously worked for Inter Press Service in New York and interned in humanitarian development in India. This article was originally published at Solutions Journal under Creative Commons-Share Alike license.